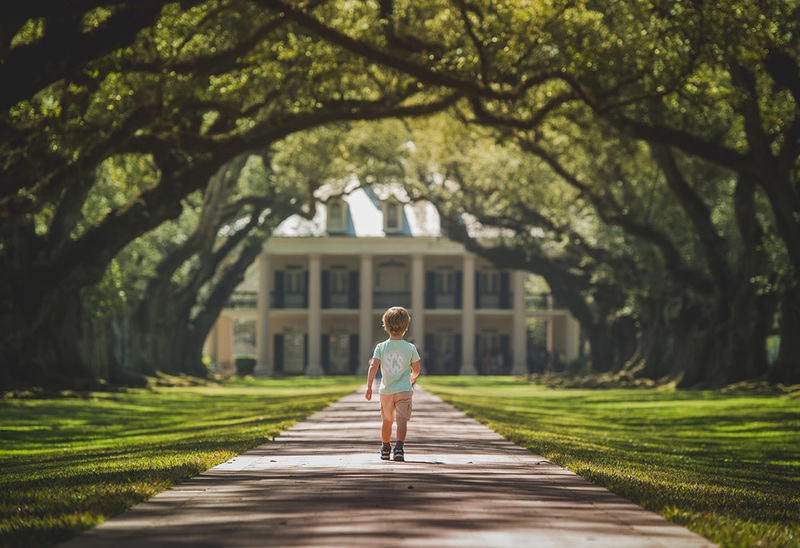 As we drove up to Oak Alley Plantation, I saw the shot I wanted! All of those oak trees in a row with the beautiful house at the end of it! I knew it was the first shot I was going to get and I wanted to get it without anybody in it! so I ran out to the end of the brick walkway and it was beautiful! Within 1 minute, there was a tour and people getting in the shot….. so I'm glad I ran! The trees are absolutely amazing to stare out for hours. Once you go out there, you will not want to come back to the house, because it is that beautiful and it;s a little bit of a walk. To the left and right is just as stunning, with all of those long branches hanging all the way down to the ground! As amazing as it is, not everyone felt the same way. Austin wanted so badly to go inside the house and decided to walk back on his own. I love his spirit! The visit there was beautiful and the history was interesting. If you love historic plantations, this is probably one the most extravagant I have ever seen. It is highly recommended by me! Here are some more pictures of the place. If you're interested in buying pictures from my adventure, please sign up for my mailing list. Thanks!